WrestleMania 35, out of the MetLife Stadium in East Rutherford, New Jersey, just wrapped up. We’ve got the match results, as well as our overall thoughts on the show, for you to check out below. Let us know what you thought about WrestleMania by tweeting us, @TheRumbleRamble. As promised, Tony Nese immediately put his strategy into effect – be the most aggressive person in the ring, take the championship. He caught the champ off guard, unleashing a flurry of strikes, even bloodying Buddy Murphy’s eye. Murphy quickly caught on to Nese’s plan and took control of the match. Nese was determined, however, getting a near fall via a moonsault onto Murphy who was hung up in the ropes. Murphy returned the favor with a sort of modified DDT, but Tony Nese persevered. The champ was gaining steam when he was struck with a sickening poisonrana from Nese, but Nese couldn’t capitalize, as he was too exhausted to attempt the pin. The men exchanged strikes, Nese coming out on top with an elbow to Murphy’s face. And after a flip onto the floor from Nese followed by a 450 from the top rope, Nese pulled even further ahead. Murphy responded with a Murphy’s Law, but landed his best move a little too close to the ropes, and Nese was able to get his foot up at the last second, breaking the pin. Buddy Murphy tried to finish Nese off, but was caught with a superkick. Without missing a beat, Tony Nese fired off his Running Kneese finisher, becoming the new Cruiserweight Champion. Nikki Cross started things off, excited for the chance to play with her fellow WWE women. After a moment of chaos from Cross, mayhem broke out among the rest of the competitors as well. A returning Ember Moon scored the first elimination, taking out Maria Kanellis, and Asuka came in quick with the second, throwing both Candice LeRae and Nikki Cross over the top rope. Lana then eliminated Ember Moon, but got a little too cocky, took her eyes off the competition, and paid for it with a chop from Kairi Sane. The sky pirate went for her Insane Elbow but was knocked off the top rope by Sarah Logan. All three members of The Riott Squad teamed up against Lana, tossing her out. Kairi then got her revenge on Sarah Logan, demolishing her with the Insane Elbow. Kairi Sane tried to eliminate Liv Morgan, but the numbers were against her, and Sarah Logan and Ruby Riott saved Liv before eliminating Sane. The villainous trio then turned their attention toward The Empress, beating her down. Neglecting to finish Asuka off, The Riott Squad triple teamed Dana Brooke, which turned out to be a mistake, as Brooke threw both Ruby Riott and Liv Morgan over the top rope. Zelina Vega began wearing down Dana Brooke but was ultimately eliminated by Sonya Deville and Mandy Rose, who then threw Brooke over the top rope as well. Deville and Rose went after Mickie James, which backfired on Mandy Rose, who was thrown out, but Sonya Deville avenged her teammate, eliminating James. Down to Sarah Logan, Asuka, and Sonya Deville, Asuka eliminated Deville, but was almost instantly taken out by Logan. Sarah Logan was just realizing what she had done when Carmella appeared from beneath the ring. It turns out the Princess of Staten Island had never been eliminated. Carmella tussled with Logan for a moment, but with a superkick to Sarah Logan, who was already hanging from the ropes for dear life, Carmella became the winner of the Women’s Battle Royal. From the very start, it was clear that The Revival did not see Hawkins and Ryder as legitimate competition; in fact, Scott Dawson spent much of the beginning of the match making fun of Curt Hawkins instead of actually fighting him. Hawkins eventually tagged out, giving Zack Ryder a shot at the champs, but whatever plan they had in mind did not pan out, as The Revival dominated Ryder, cutting the ring in half and keeping him from Hawkins. Zack Ryder attempted to make a comeback by throwing himself at Dawson, but Dash wrenched him out of the way, causing Ryder to throw himself straight out of the ring and onto the ground. Dash and Dawson continued their beatdown of Zack Ryder, taking turns against their opponent but both focusing in on his left arm. At one point Ryder nearly made it to Hawkins, but Scott Dawson knocked Hawkins from the apron. Dash had Zack Ryder pinned, and would have won, but the referee was distracted by Hawkins, allowing Ryder to break free. On his second attempt at tagging in his partner, Ryder made it to Hawkins, who was completely fresh, unlike The Revival, and instantly shifted the momentum in favor of his team. Ryder tagged back in with renewed energy, but when the action spilled into ringside, things went downhill again for Hawkins and Ryder. Hawkins leveled Dash Wilder with a spear but was thrown back into the ring by Scott Dawson. Hawkins appeared to be unconscious, but when Scott Dawson got within arm’s reach, he snatched Dawson in a roll-up, scoring the win for his team and breaking the legendary losing streak. Watching Braun Strowman make his entrance was too much for SNL Hosts, Michael Che and Colin Jost, who crawled out and under the ring the moment the bell rang. After this, bodies began flying in every direction, the numbers slowly dwindling down. As expected, the various teams in the ring worked together, The Hardy Boyz and Heavy Machinery eliminating several opponents. That is until Braun Strowman eliminated both Tucker and Otis at the same time. Shortly after, Harper was trying to eliminate Ali when Braun Strowman saw the opportunity to take both of them out. Andrade eliminated Apollo Crews but accidentally threw himself out in the process. As Braun Strowman was working on The Hardy Boyz, Jost and Che snuck up from behind, attempting to get rid of all three opponents, but were unsuccessful, as Braun got rid of The Hardys, then turned to face a terrified Michael Che and Colin Jost. Jost brought along a therapist, who tried to reason with Braun and was, of course, absolutely decimated. Michael Che tried to eliminate himself, but Braun caught him, punching him in the face on the way down. Colin Jost came close to eliminating Strowman, but was overpowered and thrown over the top rope, making Braun Strowman the winner. The moment the opening video package and the introduction from Alexa Bliss and Hulk Hogan was over, Paul Heyman marched to the ring and demanded that the Universal Championship match go first so that he and Brock Lesnar could handle their business and leave. Seth Rollins had barely touched the ring when he was met with Brock Lesnar’s fists. Lesnar ragdolled Rollins around the ring, throwing him into the apron then hurling him into an announce table before the bell ever rang. Brock demanded that the officials ring the bell, but with Seth’s ability to continue in question, it still didn’t. The Beast didn’t seem to care, however, resuming his systematic beatdown of Rollins with a smile. When the bell rang at last, Lesnar threw Rollins the length of the ring in a series of massive suplexes. Rollins shoved Lesnar away, ejecting the referee from the ring in the process, then low-blowing The Beast while there was no one to punish him for it. With the referee recovered, Rollins struck The Beast with three Curbstomps and became the new Universal Champion. Right at the start of the match, Randy Orton tried to end things with an RKO, but AJ Styles fended him off. Styles came back strong, forcing Orton to leave the ring to regroup, but it wasn’t long before Orton was back in control. After throwing Styles into the barricade, Orton forced him back into the ring, wearing him down in a clinch. When Styles escaped, he burst into a barrage of strikes, momentarily throwing Orton off his game. Styles again dodged the RKO, but was immediately caught with a powerslam from Orton. The Viper set Styles up for the DDT from the ropes, but Styles rolled out of it, locking in his Calf Crusher on Orton. Orton made it to the ropes to break the hold, but the damage to his leg was done. Styles faked the phenomenal forearm, making Randy knock the breath out of himself attempting an RKO on no one. With Orton laid out, Styles landed a 450, but Orton turned the tables with a backbreaker. Orton threw Styles from the top rope in a superplex, but did damage to himself in the process and struggled to pin The Phenomenal One. After an uppercut to Styles, Orton was able to hit the DDT. Orton got too confident here, pandering to the crowd instead of focusing on Styles, who managed to get back to his feet and kick Orton in the side of the head. Orton responded with his devastating RKO, but somehow Styles mustered the strength to kick out. Frustrated, Randy Orton went for an RKO from the top rope, but wasn’t able to deliver the move, as Styles countered with a pelé kick, knocking Orton outside of the ring. Instead of waiting for Orton to get back in the ring, Styles lept from the top rope, slamming into Orton with a Phenomenal Forearm on the outside. Throwing Orton back in the ring to prevent a count-out, Styles again prepared for the Phenomenal Forearm, which Orton prevented on the first try, but Styles instantly went for a second, this time succeeding and defeating The Viper. Aleister Black and Ricochet started off strong, getting in offense on all three opposing teams. The Bar eventually quelled the momentum when Cesaro swung Ricochet (for so long we were surprised either of them could walk afterward) while Sheamus delivered his Beats of the Bodhrán to each of his opponents in turn on the apron. Cesaro locked in a lengthy sharpshooter on Ricochet, but Aleister Black broke it up, saving his teammate. Black was then double-teamed by Rusev and Shinsuke Nakamura. He was soon rescued by Ricochet, who fell victim to Rusev and Nakamura’s double-teaming as well. Rusev and Shinsuke Namakura toppled every opponent except Aleister Black with a tower of doom. Black took out everyone in the ring, setting Ricochet up for the 630 on Sheamus. Ricochet nearly won the match, but the pin was broken by The Usos, Nakamura, and Rusev. From here, the match devolved into complete chaos, each competitor smashing into whoever was closest with their finishing move. Finally, with Sheamus laid out in the middle of the ring from The Usos’ double superkicks, Jimmy and Jey clobbered him with double splashes, retaining their championships. Tensions at an all-time high between The Miz and Shane O’Mac, it’s no surprise the action spilled out of the ring almost immediately. Shane McMahon taunted The Miz by grabbing his father in the front row. Miz chased Shane around the ring until they were both back inside it, but it wasn’t long before they were both out again, Shane McMahon laying Miz out on an announce table by hitting him in the head with a monitor. Shane climbed the ropes to dive onto Miz, but Miz’s dad stepped in the way, preventing the attack. Miz Senior then got in the ring, squaring up with Shane O’Mac, who pretended to refuse to fight him before kneeing him in the stomach and pummeling him in the corner. Miz recovered from being hit in the head just in time to save his father, throwing Shane over the barricade before going back to check on him. Once Miz knew his father was out of harm’s way, he resumed focus on Shane, taking advantage of the Falls Count Anywhere stipulation by chasing Shane into crowd. Enraged by the attack on his father, Miz fired off chair shots into Shane before throwing him into one of the announce tables higher in the stadium and putting him through another table nearby. In a particularly vicious spot, Miz heaved a monitor at Shane, knocking him backward off a balcony, breaking the roof of a golf cart on his way down. On one of the camera platforms, The Miz hit a Skull Crushing Finale on Shane, but could not put him away. Miz followed Shane to the highest point possible, where Shane begged for mercy, but Miz paid no attention to his pleas, throwing Shane and himself from the platform in a superplex. In an unlucky turn of events, Shane McMahon landed on top of Miz, and even though both competitors were incapacitated, Shane technically pinned Miz, winning the match. Tamina tried to get the upper hand early for her team, knocking everyone from the apron after laying out Bayley, but she and Nia Jax were soon taken out by Beth Phoenix and Natalya. Bayley and Sasha Banks then went to work on Peyton Royce, and when they had run her out of the ring, they moved on to Beth Phoenix. Peyton got a near fall on Beth, but The Glamazon powered out. The Boss ‘n’ Hug connection double teamed Beth Phoenix, Sasha Banks locking in the Banks Statement while Bayley ran the ropes in an effort to prevent any potential interference. Natalya went for a double sharpshooter on Bayley and Sasha Banks, but Tamina and Nia Jax finally recovered, breaking up the submission. Nia and Tamina bulldozed the other competitors, then went for a double splash on Bayley and Sasha, but were stopped by Natalya and Beth Phoenix. Bayley and Sasha landed the elbow drop and frog splash in succession on Beth Phoenix, but she kicked out. Beth Phoenix set up for the finish, launching Bayley from the top rope in a Glam Slam. When The Glamazon pinned Bayley, however, she was thrown from the ring by Billie Kay, who pinned Bayley instead, winning the match and the Tag Team Championships for The IIconics. Daniel Bryan started off the match by toying with Kofi Kingston, locking in a submission. Kofi tried to kick things up a level with a dive to the floor, but Daniel Bryan went right back to the submissions in the ring. After a double stomp from Kofi, Bryan rolled out of the ring, where Kofi threw himself from the top rope in an effort to dive onto him and instead rammed into an announce table. Back in the ring, Daniel Bryan was now in complete control, laying in strike after strike on Kofi before leaping from the top rope, grinding a knee straight into Kofi’s back. The entire locker room watching intently on a monitor backstage, Kofi Kingston managed to break Bryan’s hold on him with multiple elbows to the face, but Bryan came back with his running kicks in the corner, hitting two before Kofi attempted to counter the last one. However, Bryan trapped him in a Lion Tamer, transitioning into a Boston crab before Kofi was able to break the hold by grabbing the bottom rope. Kofi somehow managed to climb the ropes, splashing onto Bryan’s back. Bryan struggled to get back to his feet, but finally did manage it, promptly getting into a strike battle with Kofi. Kofi went for a Trouble in Paradise, but Bryan caught it, the two exchanging roll-up attempts before Kofi threw a crossbody. The New York crowd was losing their minds as Kofi Kingston hit his SOS and got the pin, but Bryan got out of it, immediately going for the LeBell Lock. Kofi escaped before he could truly lock it in, but Bryan had snapped at this point, smirking cruelly before hitting Kofi Kingston with repeated kicks to the ribs. Instead of going down, however, Kofi began returning the kicks, transitioning into an inverted suplex. Daniel Bryan rolled out of the ring, leading to a brawl between Rowan and all three members of The New Day. Big E and Xavier Woods took Rowan out with an Up Up Down Down and Kofi rolled back in the ring. Bryan dodged a Trouble in Paradise, catching Kofi with a running knee, but KOFI KICKED OUT. Infuriated, Bryan stomped Kofi’s head ruthlessly before clenching him in the LeBell Lock. The referee thought Kofi was knocked out, but Kofi held strong. Kofi rolled on top of Bryan, forearming Bryan while he gripped onto Kofi, determined not to lose his position as Planet’s Champ. Kofi Kingston went for one last Trouble in Paradise, this time connecting with Bryan’s skull. Kofi Kingston pinned Daniel Bryan and became the new WWE Champion. A sobbing Xavier Woods and Big E charged into the ring to celebrate with their friend, gifting him his own championship belt after discarding Bryan’s hemp one. 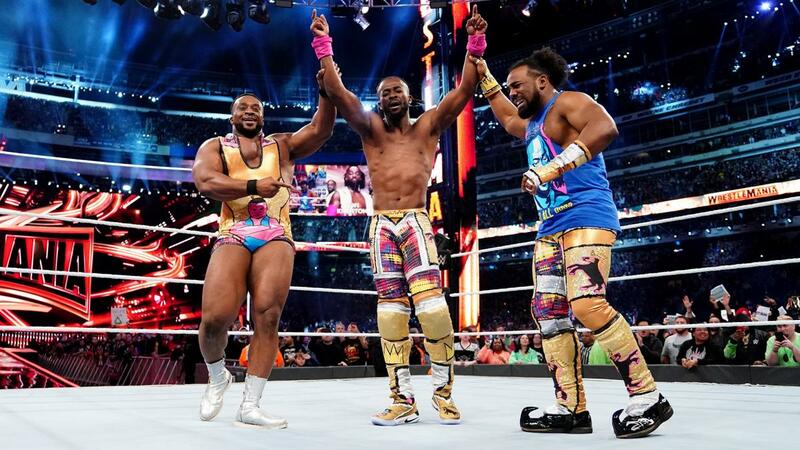 Kofi’s children joined them in the ring and the five of them embraced as the entire stadium cheered and cried along with the new champion and his family. Rey Mysterio did his best to get a head start, hitting a 619 on Samoa Joe in the opening moments of the match. Unfortunately for Rey, he was immediately caught in a Coquina Clutch and put to sleep. Drew McIntyre went for the early advantage, but was caught in a Samoan Drop instead. Roman Reigns picked up steam until McIntyre slammed him down, throwing chops to wear The Big Dog down. Intent on annihilating the final Shield member, Drew McIntyre mercilessly battered The Big Dog. McIntyre ran at Reigns in the corner, where Reigns tried to stop him, but McIntyre picked Roman up by the legs, slamming him down to the mat. The Scottish Psychopath then placed Roman on the top rope, climbing up after him. He began taunting The Big Dog, who attempted to reverse whatever McIntyre had planned, but McIntyre got the better of him, grabbing him by the head this time in order to sling him down. McIntyre continued to beat Roman down, but went too far when he brought Roman’s Shield brothers into the taunts and slapped him in the face, firing Roman up for an avalanche of offense. Reigns launched McIntyre into the barricade, then Samoan dropped him to the floor. Back in the ring, Roman Reigns continued to gain momentum, gearing up for the Superman Punch, which McIntyre dodged, but Roman came back for another, this time catching McIntyre in the face. With a massive spear, Roman Reigns defeated Drew McIntyre, defending his own honor, as well as that of his brothers, Seth Rollins and Dean Ambrose. Three Eliases, two on the big screen, one in the ring, played a quick song before the Elias in the ring got started on his solo performance. He was interrupted by a video showing Babe Ruth hitting a homerun, and when the video was over, The Doctor of Thuganomics made his entrance. John Cena, decked out in full thuganomics gear, came to the ring to rap battle Elias. After tearing Elias down with words, The Doctor hit both a Five Knuckle Shuffle and an FU (yes, he scrapped the name AA for the night). Triple H and Batista wasted no time utilizing the no disqualification rules, Batista throwing Triple H into one the announce tables. Triple H responded by pulling a length of chain from a toolbox and repeatedly whipping Batista over the back with it. He then wrapped the chain around Batista’s head, jerking it backward as The Animal fought to free himself. Triple H continued the punishment, throwing Batista into the steps before grabbing a pair of channel locks, attempting to break Batista’s fingers with them. Taking a page from Pete Dunne’s book, Triple H bent Batista’s fingers back, then stomped on his hand. Batista escaped into the ring while Triple H grabbed some needlenose pliers, trapped Batista beneath a steel chair and yanked his nose ring out. Fist wrapped in chain, Triple H went after Batista at ringside, but Batista was ready this time, tossing Triple H into the announce table twice then throwing him into the barricade. Triple H was slammed into the announce table a third time before Batista again rammed him into the barricade. Batista used a steel chair to further damage The Game, then threw him back in the ring, ramming him with shoulders in the corner. After a few near falls on Triple H, The Game went for a Pedigree, but was unable to follow through. Back at ringside, Batista launched a set of steel steps into Triple H’s face. While Triple H was on the ground, Batista set the steps on top of the announce table, then laid Triple H on top of them. Batista prepared for the Batista Bomb, but Triple H reversed it, throwing The Animal into the neighboring table. The second Batista had gotten to his feet, Triple H speared him, putting him through the third announce table in the line. Both worse for wear at this point, Triple H and Batista struggled back to the ring. Batista got in first, and Triple H took a moment to search underneath the ring, pulling out a sledgehammer. Triple H had just stepped back in the ring when he was met with a spear from Batista, who followed it with a pin, but The Game kicked out. Batista picked up the sledgehammer and lunged at Triple H, who kicked him the face to avoid the attack. Batista successfully hit a Batista Bomb, but again, Triple H kicked out. Bringing steel steps into the ring, Batista and Triple H climbed to the top rope. Triple H escaped, sliding underneath Batista and powerbombing him into the steps before delivering a Pedigree, but Batista survived. Triple H ran at Batista with the sledgehammer and was caught in a DDT to the steps, laying him out. While the referee was checking on Batista, Ric Flair appeared, handing Triple H a second sledgehammer. Triple H struck Batista with the sledgehammer in mid-air while jumping from the steps, then finished with a Pedigree, winning the match and avenging his former Evolution-mate, Ric Flair. Kurt Angle started off strong with one of his signature suplexes, but Baron Corbin wasn’t about to be embarrassed and came back with a deluge of strikes to the gold medalist. Angle threw three more suplexes and pinned The Lone Wolf, but Baron kicked out. When the suplexes didn’t do the trick, Angle tried for the ankle lock, but Baron again powered out, responding with a Deep Six. An Angle Slam nearly won Kurt Angle the match, and when Baron again powered out, the singlet straps came off and the ankle lock went on. Corbin escaped and, in a last-ditch effort, Kurt Angle hit a moonsault. Baron rolled out of the way, retaliated with a Deep Six, and took the victory. Kurt Angle didn’t let the loss break him, however, and stood up, grabbed a microphone, and asked the crowd for one last chant. The Demon King was out to dominate, springing into a series of kicks and throwing Lashley out of the ring at the start of the match. Lashley was clearly caught off guard but came back with two massive suplexes once he had his feet back underneath him. Lashley threw Bálor into the barricade and Bálor responded with a slingblade, taking a moment to intimidate Lio Rush. Bálor on the apron, he was distracted by Rush just long enough for Lashley to slam into him with a spear, knocking him onto the floor. Bálor wasn’t down for long, however, and came back to the ring to hit an incredible powerbomb before going for his Coup de Grâce and reclaiming his Intercontinental Championship. All three woman stared each other down, waiting for someone to make the first move. Ronda Rousey broke the standoff by beating down both of her opponents until she finally caught a little payback from Charlotte and Becky. Ronda laid out at ringside, Charlotte and Becky went one-on-one in the ring, throwing brutal strikes back and forth until Ronda came back in. Rousey went straight for Lynch, who momentarily worked together with Charlotte to take Ronda out, drop kicking her from the apron back onto the floor. Disregarding the moment of teamwork, Charlotte began ragdolling Becky Lynch, laying her out before going for the moonsault, but Becky put her knees up, trying to lock in the Dis-Arm-Her. Charlotte escaped and chaos again ensued between all three women. Charlotte calmly threw Becky from the ring, choosing to focus her efforts on Ronda. The Queen threw multiple chops at Rousey, holding her in a submission, but Becky Lynch jumped back in, attacking both Charlotte and Ronda. Ronda needed a moment to regroup, so Charlotte and Becky again went one-on-one, Becky landing a Becksploder and pinned Charlotte, but couldn’t put her away. The moment the women were back on their feet, Ronda hit them with a crossbody before locking them in a double armbar. Again, Charlotte and Becky put their differences aside to focus on Ronda, powerbombing her together. Charlotte threw Becky from the ring and pinned an incapacitated Ronda Rousey, but Ronda kicked out. A uranage from Becky Lynch caused Charlotte to roll out of the ring, leaving Ronda alone to be trapped in a Dis-Arm-Her from Becky. Ronda escaped, but Becky threw a knee and locked in her submission again, this time in the ropes. With a big boot from Charlotte, Becky was forced to let go of Ronda, who left the ring. Becky still on the top rope, Charlotte delivered a Spanish fly, flinging both herself and Becky to the mat. After damaging Ronda’s legs on one of the ring posts, Charlotte dispatched Becky before coming back into the ring to perform the Figure Eight on Ronda. In the middle of the submission, however, Charlotte and Ronda were hit with a leg drop from Becky. Becky introduced a table into the ring, but when she went to put Charlotte through it, Ronda broke up the spot, throwing the table out of the way. She was about to attack Becky when she and Becky were both clobbered with a spear from Charlotte. Charlotte propped the table up in the corner, then slammed Ronda’s face into it repeatedly before turning her attention to Becky Lynch. All three women were laid out for a moment, and when they got their feet, Charlotte looked to be attempting a spear, but was caught by Becky and Ronda, who threw her through the table. Without so much as a pause for breath, and Ronda kneed Becky before hitting a Piper’s Pit, which Becky reversed into a pin, winning the match and becoming the Undisputed Women’s Champion.